We heard that noise you just made. We made it, too. There's really no other reaction to seeing a quadri-thonged sandal for the first time in your life. Imagine each thick, leather cord flossing the space between each toe to create an inevitable salad of blisters. Sorry for the visual, but right? Ladies and gentleman, please meet the Wellrox. These toe-tendril sandals will make you look like you have another set of miniature toes gently nestled atop your real ones. 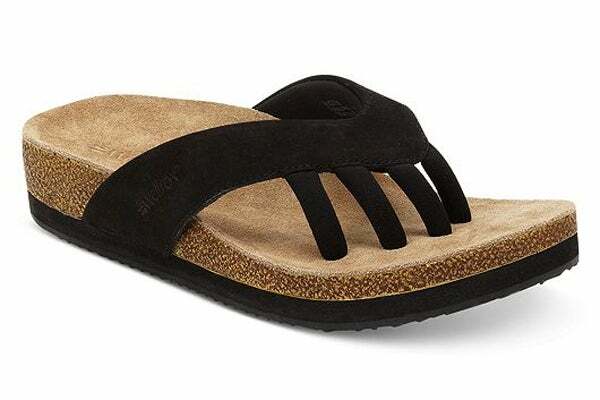 Reads the product details on Macy's, the Austin sandals feature "signature GRABS technology that provides increased grip and toe alignment for a more balanced and comfortable fit." Comfortable? To walk with your toes splayed out in attack mode? Um, yeah...okay. We're getting charley horses just looking at the photo. For those who want a more sporty pair of toe floss, check out the Cloud sandals. Those favoring a Birkenstocks vibe? The Newport might be for you. Want something with a touch of femininity. You'll love the floral topper on the Chloe sandal. (Don't worry, Snooki — they've got one for you, too).